This CellML version of the model has been checked in COR and PCEnv and the model runs to replicate the original published results as depicted in figure 5b of the paper. The units have been checked and are consistent. ABSTRACT: A detailed model mechanism for the G1/S transition in the mammalian cell cycle is presented and analysed by computer simulation to investigate whether the kinetic origins of the restriction point (R-point) can be identified. The R-point occurs in mid-to-late G1 phase and marks the transition between mitogendependent to mitogen-independent progression of the cell cycle. For purposes of computer simulations, the R-point is defined as the first point in time after mitosis where cutting off mitogen stimulation does not prevent the cell reaching the threshold activity of cyclin-E/cdk2 required for entry into S phase. 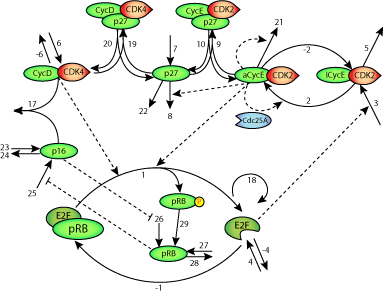 The key components of the network that generate a dynamic switching behaviour associated with the R-point include a positive feedback loop between cyclin-E/cdk2 and Cdc25A, along with the mutually negative interaction between the cdk inhibitor p27Kip1 and cyclin-E/cdk2. Simulations of the passage through the R-point were carried out and the factors affecting the position of the R-point in G1 are determined. The detailed model also shows various points in the network where the activation of cyclin-E/cdk2 can be initiated with or without the involvement of the retinoblastoma protein. A detailed mechanistic model of the GI/S transition in the mammalian cell cycle. 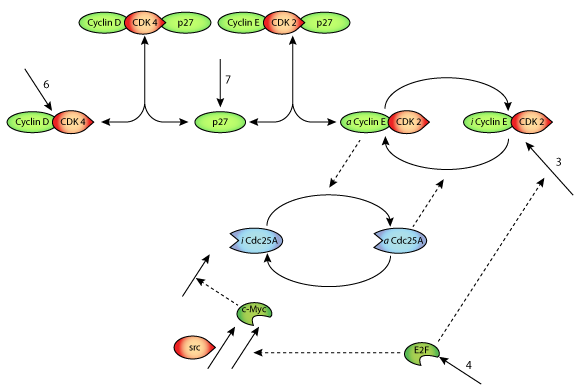 pRB-independant pathways leading to activation of CycE/Cdk2. Derived from workspace Aguda, Tang, 1999 at changeset d080a1693583.